The causes of stridor can be divided into congenital and acquired. The congenital causes of stridor are congenital flaccid larynx or laryngomalacia. 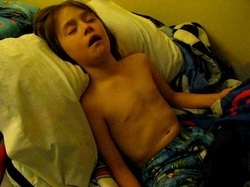 The acquired causes of stridor are bilateral vocal cord palsy due to esophageal carcinoma, thyroid carcinoma and brainstem stroke,malignancy such as laryngeal carcinoma, bronchial carcinoma or tracheal carcinoma which cause the intraluminal obstruction and external compression by malignant nodes. Other acquired causes of stridor goiter, foreign bodies, cricroarytenoid rheumatoid arthritis, laryngeal edema ( inhalation injury, anaphylaxis reaction), infection ( retropharyngeal abscess and epiglottitis) and iatrogenic causes such as post thyroid surgery, stenosis post intubation and stenosis post tracheostomy. Stridor can be a symptoms of asphyxia and airway obstruction . In this case urgent cricrothyroidotomy is required. Stridor is also associated with acute epiglottitis. Acute epiglottitis is presented with respiratory depression, severe sore throat, stridor and swallowing difficulty. What is stridor? Stridor occur due to upper airway obstruction as a high pitched inspiratory sound. Stridor is usually indicates partial obstruction of the airway as complete airway obstruction is silent in nature. Violent bouts of coughing and sudden onset of stridor is an indication of inhalation of any foreign bodies. History from witness is reliable here. Anaphylactic reaction may cause laryngeal edema. Laryngeal edema is presented with stridor which develop over a period of seconds and minutes. The laryngeal edema is accompanied by facial edema and urticaria. In this case, the treatment should begin immediately and specific allergen ( trigger factors ) should be noted. Urgent treatment and admission are required. Laryngomalacia is known as infantile stridor. There will be an extreme infolding of the aryepiglottic fold or epiglottis during inspiration due to improper cartiliaginous supprot. The stridor is aggravate by head flexion while extension of the head and prone position may improve the patency of the airway. 2-3 months are required to resolve the stridor. Retropharyngeal abscess and massive enlargement of the tonsil due to glandular fever may lead to respiratory obstruction. Neck swollen ( goiter ) may be noticed by the patient and patient will either be euthyroid or complain of hyper or hypothyroidism. Rheumatoid arthritis is presented with deformities, stiffness and pain in the joint. Cricoarytenoid involvement may also cause stridor. The main features of malignancy are weigh loss. In laryngeal caricnoma , besides weight loss, hoarseness of voices may present as an early signs of malignancy. Bronchial carcinoma is commonly affecting chronic smokers with chronic cough and hemoptysis. Partial obstruction of the lower intraluminal airway may produces inspiratory monophonic wheeze while partial obstruction of the upper intraluminal airway may produce stridor due to bronchial carcinoma. Esophageal carcinoma is presented with rapid progressive painless dysphagia. The precipitating factors of stridor may include iatrogenic causes. Thyroid surgery may lead to bilateral recurrent laryngeal nerve injury, hematoma and laryngeal edema which later lead to upper airway obstruction. 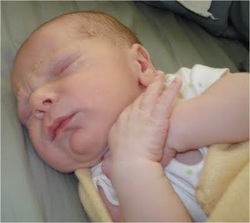 Tracheostomy and long period of intubation may lead to tracheal stenosis which causes stridor. Inhalation injury due to high temperature of inhaled gas from fires may lead to stridor. On examination, patient may appear distress in case of acute partial upper airway obstruction. Assess the patient and identify of any signs of anaphylaxis reaction such as widespread wheezing, facial edema, urticaria and hypotension. Inhalation injuries may present with singed nasal hair from thermal exposure and soot on the face. Bronchial carcinoma may present with clubbing of the finger. Rheumatoid disease is characterized by bilateral symmetrical deforming arthropathy that include small joints of the hand (PIP or MCP). Goiter will also be visible on inspection. Inspection of the threat is required to identify the causes of stridor. Indirect laryngoscopy is useful for inspection. Glottic carcinoma or supraglottic carcinoma is visible on inspection. In bilateral vocal cord palsy, the cord is lie in the cadaveric position and a small glottic apertue is visualized and does not widended while attempting to inspire. Carcinoma of the esophagus, bronchus, pharynx and larynx as well as infectionis presented with cervical lymphadenopathy. The trachea may be skewed to one side due to compression effect from goiter which is palpable in the neck. Chest examination is useful to identify any manifestation of the bronchial carcinoma such as rib tenderness, pleural effusion, collapse of a segment of the lung and monophonic wheeze. The investigation may include full blood count, ESR, thyroid function test, lateral soft tissue neck X ray and chest X ray, CT scan of the neck and thorax, bronchoscopy, fine needle aspiration of the goiter, upper gastrointestinal endoscopy and fiber optic laryngoscopy. Full blood count may reveal an increase in white cell count for sign of infection. Raised ESR indicates malignancy or infection. Raised or reduced normal thyroid function test is accompany by goiters. The present of radio opaque foreign bodies can be detected by using the lateral soft tissue neck X ray. Radio opaque foreign bodies can also be detected with frontal and lateral view of X rays. Chest x ray may also reveal hilar lymphadenopathy which uscually cause compression of the bronchus or trachea. Bronchial carcinoma usually detected on chest-x ray as a collapse segment, pleural effusion, consolidation of the lobe, peripheral mass and central mass. CT scan of the thorax and neck is useful in staging of laryngeal carcinoma, bronchial carcinoma, esophageal carcinoma and thyroid carcinoma. Bronchoscopy is useful to detect for any mass lesion in the proximal airway or distal trachea. The underlying etiology of goiter is detected by using fine needle aspiration cytology. Upper gastrointestinal endoscopy is useful to detect the present of carcinoma which present as dysphagia and infiltrating recurrent laryngeal nerve . Fiber optic laryngoscopy is useful for detection the present of tracheal stenosis, tumor masses or vocal cord which later allow biopsy should be taken.